SAN FRANCISCO -- Jackson Square is a neighborhood in San Francisco inhabited by companies brimming with ideas of integrating designs into new technologies born in Silicon Valley. At the center of this design-centric area is Samsung Design Innovation Center, which is responsible for the designs of Samsung Electronics’ new products and services. The center was relocated from nearby Palo Alto in Silicon Valley in 1994 to Los Angeles in 2008, then back up to San Francisco in 2012. 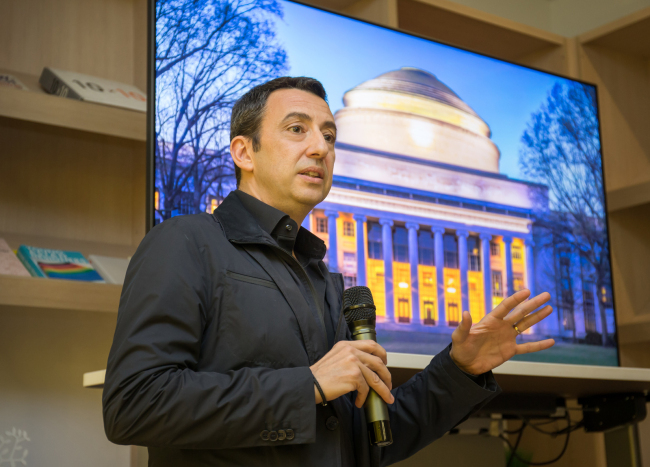 Federico Casalegno, head of SDIC, explained that the center at the moment is focused on designing user experiences on Samsung’s mobile products, including the upcoming foldable smartphone that could be released as soon as next month. “The foldable phone is a breakthrough in technology innovation,” Casalegno said at a press event Thursday. SDIC has also contributed to designing various wearable Samsung products, including the Gear Fit2 Pro in 2017 and Gear Icon X last year. The center closely works with Samsung’s IT & Mobile Communications Division on creating new designs that help maximize user experiences with the wearable devices, according to the head. Samsung is currently running seven design centers worldwide in countries including the United Kingdom, Brazil, India, Japan, China and Korea.